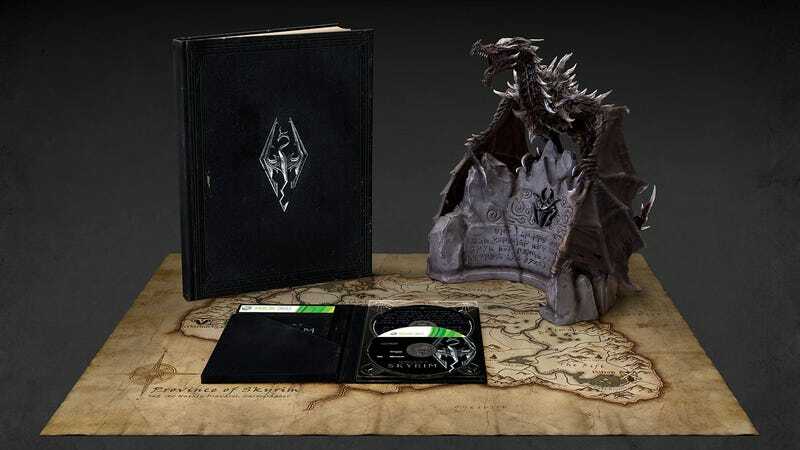 Soaring high above the $29 price point suggested by Bethesda's Todd Howard on the wings of a 12 inch PVC statue of Alduin, the World Eater, The Elder Scrolls V: Skyrim collector's edition seems like overkill for an indie card battle game. My mistake! I seem to have mixed up The Elder Scrolls V: Skyrim with Scrolls, the card battle game from the makers of Minecraft. This is the collector's edition for the next entry in the beloved role-playing game series, guaranteed to devour the hearts and minds of countless gamers on November 11, before moving on to steal years from the modding crowd. Along with the attractive statue, the collector's edition also house a making-of DVD and the mother of all art books, a 9 by 12 beast with more than 200 pages of stunning artwork. The Skyrim collector's edition can be yours for only $149.99 this November, or you can save your money and buy almost five games when the prices finally get regulated.